All the travel information at fingertips! Book event tickets on the go! Find accommodation as per requirements! Benefit from varied payment options! Fill the right information to place order! This travel management system serves as a ‘travel wiki’! It is the ocean of information about the travel places, events happening around, places of interest, tickets to the events, accommodation, hotels, prices and payment information. All the information can provided to customers systematically, in the separate tabs, so as to give them an easy and quick access to it. Your customers might want to take a look at the famous places of interests in various cities or the events happening in a particular city. If they decide upon a city or an event, they might want to buy ticket for that event and book a room in a hotel. Apart from that, they might want to know different types of accommodation and the type of payments that they opt for. This is the one stop travel eCommerce solution for your customers to seek all the information at one place. with ticket system integration like Ticket Evolutions. They can select the type of payment they are interested in and click on Book now. There is merchant gateway integration with subscriptions and multiple milestone based payment. Hotel package (along with the selected occupancy and additional tour options) with the total price, book early deposit due today and final balance. If all the information is correct, he can proceed to checkout. This online booking system asks for the billing and shipping address and shows shipping information. However, it also asks for traveler information and type of bed, as per the number of travelers the customer had selected during selection of the hotel. If customer has booked three rooms, all these information will be asked three times. At the end, it will ask for the credit card details and then show the check out review. Once everything is filled, customer can click on Place Order which will then get redirected to Order Success page for customer to check if all the details are correct. All the above mentioned features of this easy booking system were frontend features. However, all these features also exist in the backend. So, the customized order creation can be done from the backend. Also, the admin can edit the orders. The hospitality management solutions streamlines the entire process of your business; right from providing the right information related to events to your customers and booking tickets for the events to travel packages including hotel bookings. This is the one stop solution for all travel agencies. 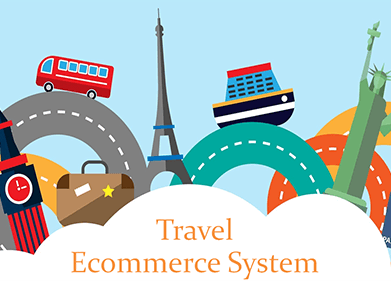 If you are in the quest of the system that helps you fosters your business process, the travel e-commerce system is just perfect for you.